Rosmarie Waldrop chose Meredith Stricker’s Mistake as the winner of the Caketrain Chapbook Competition in 2011. 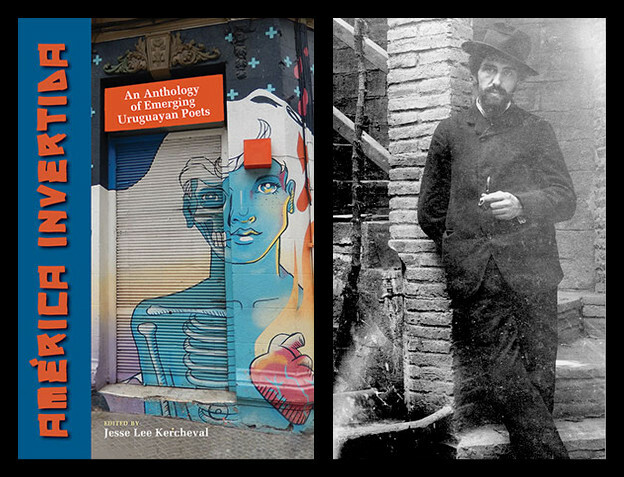 “Chapbook” seems a misnomer for the seventy-eight-page book, and the collection finds itself at the intersection of the most interesting work today in contemporary poetics. It is innovative without being apolitical, experimental without compromising emotional resonance, and uneasily categorized. In notes for the book, Stricker writes that Mistake “was set in motion by the ongoing full-moon practice of ryaku fusatsu, a repentance or forgiveness ceremony in the Zen tradition, paying attention to accidents, overprints, flaws, the discarded, the unwanted, the cast-off.” Brian Teare, in his blurb on the book’s back cover, calls Mistake “a brilliant book about reading, particularly about reading events that could be construed as accident or chance.” Through a fiercely intelligent engagement with psychoanalytic theory (Freud), Buddhist philosophy, evolutionary science (Darwin’s tangled bank metaphor), labor (The Gleaners), plotting of history and art (Walter Benjamin’s Archives), interpretation of vestige (Gustaf Sobin’s Luminous Debris), and mythology and memory (the Orphic Hymns), the meditation engages readers through structural virtuosity, stellar visual innovation on the page, and a sharp attentiveness to language in the fusion of various lexicons: historic, artistic, scientific, and philosophic. In [a] state of suspension the art that is created is infinitely susceptible to new shapes because no shape can be regarded as final. No form is safe when the poet is in a state of perpetual self-transformation, or where, as Hegel suggests, the artist is in a condition of infinite plasticity. In Mistake, Stricker embraces a variety of shapes through which to defy certainty. The condition of “infinite plasticity” in the artist’s work demonstrates the teeming, dynamic, and interconnected relationships between body, mind, text, and land. A quote from Freud’s Psychopathology of Everyday Life fringes Mistake’s table of contents and begins the book: “the numerous little slips and mistakes which people make … have a meaning and can be interpreted” (7). The first angle from which Stricker approaches the mistake is thus a psychoanalytic one. Stricker quickly establishes that to know the human being’s slip or mistake, we must interpret it. She asks how we measure the human slip or mistake without imposing our own ideas of right or wrong, about behavior or action, through interpretation. Beginning with Freud alone might destabilize the answers. And what can we really determine about the human subject with individual subjectivities at play? With scattered, bracketed, and converging text, Stricker conjures the binary blink of the twenty-first-century Internet age. Stricker points to spatial considerations, a global arena inside of which we are at once closer to one another and more distant. With tongue, ink, or computer screen, we program our surroundings. We place and displace language like a woman pulling out and placing inside rings in a jewelry box. Rings of course operate here both as noun and verb, conjuring both visual and aural image. Visually and sonically, Stricker moves outward from suburbs to stars and the surface of the moon where “earth spins spine spins” (9). From spins to spine, this dizzying caesura returns us from stratosphere to the body. The piece is an apt embodiment of the book and places readers within the rich, emotional landscape of a pained, postmodern world. The first of Mistake’s seven sections is entitled “The Book Is Heisenberg.” Werner Heisenberg, a German physicist, determined our observations have an effect on the behavior of quanta. To know the velocity of a quark we must measure it, and to measure it, we are forced to affect it. The same goes for observing an object’s position. Uncertainty about an object’s position and velocity makes it difficult for a physicist to determine much about that object. By way of the section’s title, Stricker suggests that we consider a “mistake” within the realm of science, where science’s processes are as fallible as those of psychoanalysis. The mashup arrives just after Maurice Merleau Ponty’s epigraph: “We must consider speech before it is spoken” (13). Considering speech before it is spoken is to see speech and language as the mind’s swarm: as knowable as unknowable, nonlinear, variable, capable of mistakes. Here you can discern text behind the text more clearly than you can in the book. The clearest word emerges at the top. But is it “born,” which might suggest joining this world, or “horn,” which would suggest the noise we make? Stricker illustrates multiple narratives, or multiple strands of ideation, even with a simple mistake. At the bottom right-hand side of the page is a more linear progression. Whether or not the two lines serve as a translation or transliteration, the two lines point to human error. They even instruct us how to deal with the most mundane or childish errors like spilling milk. 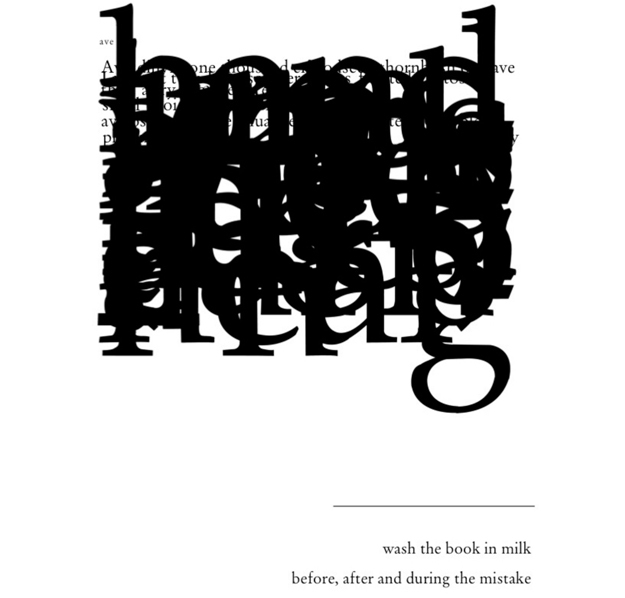 But these are somewhat nonsensical instructions when they tell us to wash a book in milk in order to correct a mistake. Using phrasal repetition allows Stricker to play with meaning, as one proceeds through the poem. With the repeated contact of “stars” with “foreheads” and “hands” and “inner ear,” Stricker also conjoins atmosphere to earth, body to stars. The “stars are Being / barbed wire in stars” indicates that the activity here is not some utopic stargazing venture. Existences are at stake. Something ominous is at play when stars are barbed. Further, barbed wire in stars hint at human beings’ use of land. Outer space is just another jeopardized frontier. 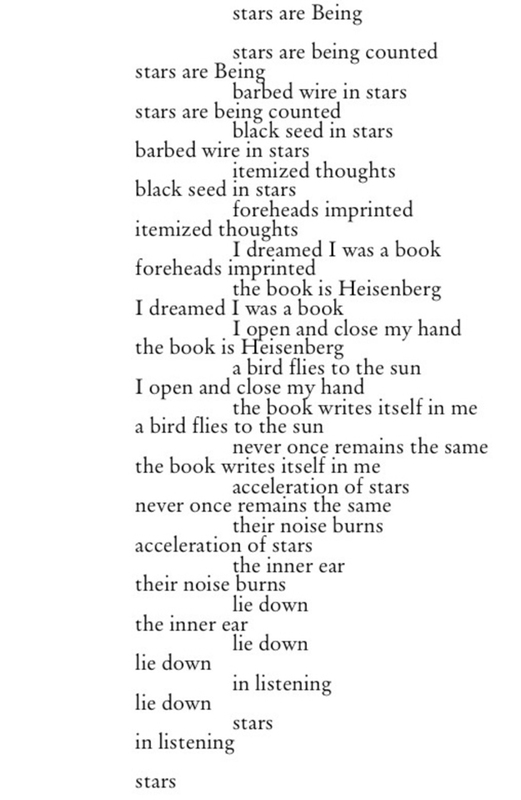 At the end of the piece, Stricker encourages us to listen to what the stars have to tell us and even intimates the human body’s connection to stars. We are, after all, stardust. In this section’s last piece, as elsewhere, Stricker works with the idea that a human being is a text too in the section’s last piece. Traffic is “humanity surging out the boundaries of its own skin” (17), and “just as leaves fall and translate the forest, chaparral, grassland,” “no street adheres to its past self” (17). Leaves of books and leaves on trees connect book, body, and street. We are multitudes bursting within, weaving histories across the land and through text. The study of evolutionary relatedness among various groups of organisms through molecular sequencing data and morphological data matrices. The study of evolutionary relatedness among various groups of organisms through molecular sequencing data and morphological data matrices. Stricker brings the study of genetic connection across groups of organisms to the fore, elevating the importance of change to data in such studies. Etymologically the word phylogenetic derives from the Greek phylon [tribe] and genesis [origin]. Error is contextualized with human beings across the evolutionary timeline. In our “adaptive improvisational helix of altered phoneme plans,” language is adaptable, error-prone and not without the power to impact other living things. Error, like a bee swarm, gathers around the human body. Then, as if by something more like vultures than flying insects, shards (like glass) of meat are carried away. The next page of the section juxtaposes Dante, the hunters of Cueva de la Manos or Chauvet, and Plato’s allegory (22), where the “cave” of Dante’s Commedia and Plato’s shadowy walls seem materializations of scientific experiments themselves. Throughout “Mistake — An Evolutionary,” words are struck through and amended, offering not only a translation of what has already been written but a multiplication of sound play as “aphasic side-effects of living / in human weather” continue a “musical cerebellum loose / slipped euphoria / could be another word wool / particular, self existing” (23). In the last two pages of “Mistake — an Evolutionary,” Stricker intimates the violence of language and mistakes. We “mistake plunder for pleasure”; we “mistake oil for grail.” We “mistake money for monet”; we “mistake faith for … fake.” We “mistake rapture for capture / captive, capital, capsized” (24). Neo-imperialism, commodification, religious hypocrisy, and ruthless global capitalism are evoked while “the ferocity of darkness seeps through” and “death is the stain we cannot live / without” (25). The tangled bank is as much about the evolution of species here, as it is about negotiating the gulf or ruin with song. The first poem has repeated lines, the first of which is: “the coast of Japan is thirteen feet closer to us” (31). The piece possesses similarities with “[stars are being]” discussed earlier and gestures to Fukushima and other catastrophes natural and manmade. Heaven is a rumor and a disaster (31). 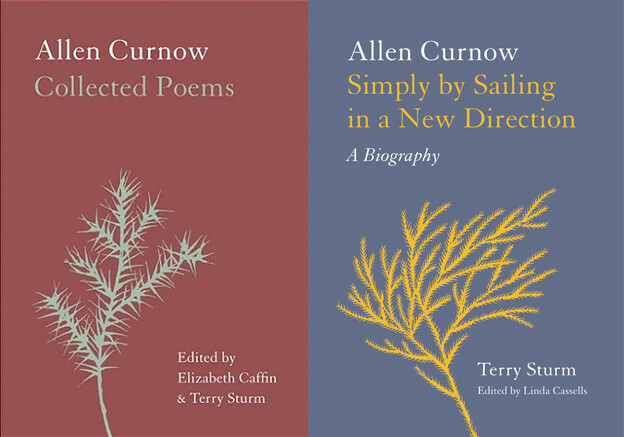 Words like split and wake are repeatedly juxtaposed with phrases such as “heaven is a bestseller,” “heaven is / jesus with sea green eyes,” and “my god is an ocean” (31). The poem points at the unfortunate tendency of our citizens to eye the paradise that is waiting on the other side rather than to protect the wonders that exist right in front of us. Repetitions serve as litany, as means of connecting humans in time, and as emphatic statements to wake up. This piece puts not only the land in conversation with bodies but also interconnects those bodies across the planet. Formally, though, this piece is different than “stars are beings” from the first section. Repetitions are disrupted. Coding is undone. Waste in the tangled bank is untangled. Broken in different lines, and sustained across the page, Stricker repeats: “what they call garbage is closer to liberation” and “there is no away we can throw things” (34). Garbage is alone, homeless, set aside, present. 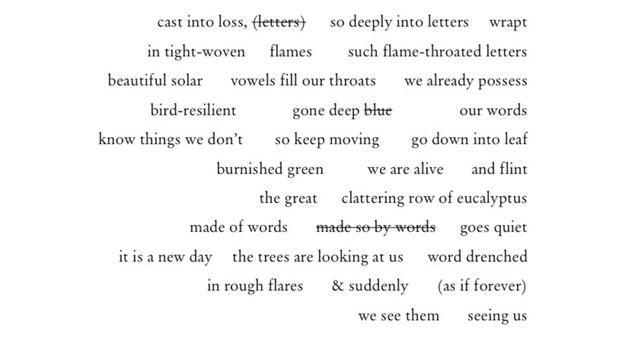 A poem may place [sounds, conceptual shapes, and events in the outside] together. As such one’s conceptions alter oneself and being, and alter their one being outside. The individual (and any individual instance) occurs as reading. As: while, alongside, and being (reading is an act). With right justification, text upside down, the word “mistake” in red, Stricker pushes language in several directions for reading to be such an act. The last of “Waste Products” reads: “unlike any other light // radiant fuel rods cast-away for millennia tours of duty // entombed in sentient earth” (35). Radiant light is darkened, cast away in war. With all the work Stricker has done to put land, bodies, and language/art into conversation, the waste is defined as garbage and polluted land as much as it is defined as what stays and gets thrown away on the page. “Waste Products” seems to ask if a book, however inexact or amiss, can make a difference or cause its own reaction. Will it go into the garbage, too? How is it a mistake? How is a book waste? Is this book, like an exploding reaction, a mistake too? Is the book complicit with human error? How are we complicit? The fourth section opens: “I will not be smoothed out / fur, roughened / shies away // articulate waste / matter / scattered” (39). The I unsurprisingly has human and animal qualities and “shies away” from scattered waste but refuses to be “smoothed out” or silenced — at times approaching destruction with ferocity and at times turning inward. At times there is the ability to speak of such waste, and at times there are no words. The speaker is “articulate waste” but not “matter,” as matter is struck through. “A Burning Thing,” because of its placement after the previous section, emerges from the waste. The “thing,” a breathing thing but also a haunting thing, appears as whatever our culture objectifies or commodifies or manifests through greed, delusion, and hatred. If there is “no ‘away’ we can throw things,” as the previous section attests to, then what is the burning thing? It is the unmarketable word, the spoken word, the testimonial that burns. A meditation of burning thing becomes a personal matter of the humanimal alive on the land, experiencing the devastation and articulating it with song. By the end of the section, we are asked to look at what is made of words, rather than what is made so by words. And what is made of words burns in “flame-throated letters,” “vowels [that] fill our throats,” in the “clattering row of eucalyptus” (42). Letters at the beginning struck through are re-inhabited. Letters “see” us and allow us writing and reading modes through which to interpret ourselves. Languages and silences comprise a matrix of simultaneous beauty and difficulty, denial and testimony. “Black Stone” begins with the following Rothko epigraph: “I would rather confer anthropomorphic attributes upon a stone than dehumanize the slightest possibility of consciousness” (45). Text is found in the precious resource of water, is scraped dry and articulated in art. The word in Hebrew for bee is etymologically related to the word of God. This is significant, because language is of the body, in life and in death. As “living ones” pass through this life, so do bees (the word) pass through this too. There is of course the earlier link between science, bees, humans and language in “Mistake—an Evolutionary.” But besides that, “letter” ends ultimately with a question. What do the bees think we are (or what does the word think we are)? Are we “flowers or meat/or something in between” (47). Throughout “Black Stone,” Stricker humanizes the possibilities of consciousness, concretizing the abstract. This bears consideration because Stricker examines not only individual consciousness but also the broadening consciousness of a culture and the way it views its land, its money, and its fellow beings. And Stricker does this with compassion. This section is a reminder of the always changing qualities, the imperfection, and the interconnectedness of living things. “I love you like ochre,” she ends; “I love you” (50). A seal rises up out of the sea at the beginning of “Orphics”; the speaker of the poem barks to it like a dog. This is a moment of levity, apt for a section that meditates about death but speaks largely of this life. “The Gleaning of Fields” is a significant piece for this section and for the book. Gleaners of course are individuals who pick at already reaped fields for odd remains or leftovers. Just after Stricker arches Orpheus over a field, a prose block of chemical compounds, a litany of odd remains and leftovers related to laborers, appears: residue of methyl bromide (ozone depleting chemical), malathion (pesticide), naled (insecticide), copper hydroxide (a product of smelting). Stricker gives the environment human qualities: “wetlands, aquifers, jetstreams” are identified as “the veins” (59). This is not to oversimplify what Stricker is doing here. Neither here nor elsewhere do Stricker’s efforts seem focused on creating a narcissistic anthropomorphism or some pat conflation of nature and humankind. Poetry provides, as Scalapino relays in “Eco-logic in Writing,” a mode through which to see “plains of action of people and natural phenomena at once … all times exist separately at once, present-future-past” (63). For several of the pieces, Orphic hymn fragments serve as not only points of departure but also a sort of ongoing palimpsest. In fact, there is often the feeling when reading this book that there are at least two, or more, ideas happening simultaneously. 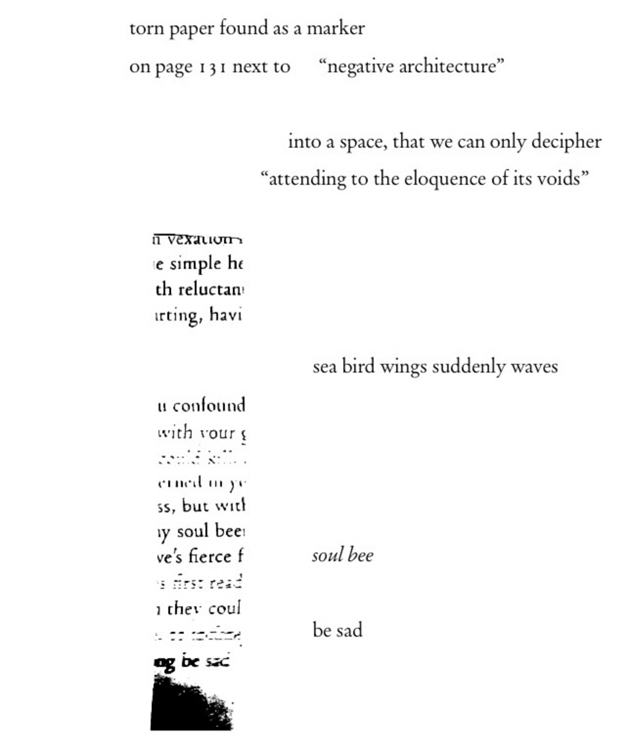 Text lies on top of itself: “fractal Ionian shards” and “ghost letters” (63). The gaps that the fragments and columns create are informative. These push the reader to discover meaning. In excavating layers of past meanings, Stricker foregrounds the temporal. 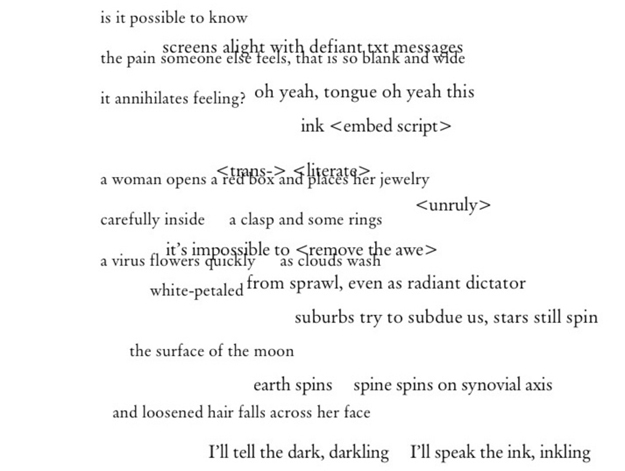 Text fragments speak to the transitory quality of language and human life. There are many ways one can read the piece through columnar arrangement. Throughout the section, as in this poem, wilderness is language, and like the body broken by land or in some ways unable to speak. How a body ages and dies (68) is once again put into conversation with the land: “what death might be white echo from below” (69). 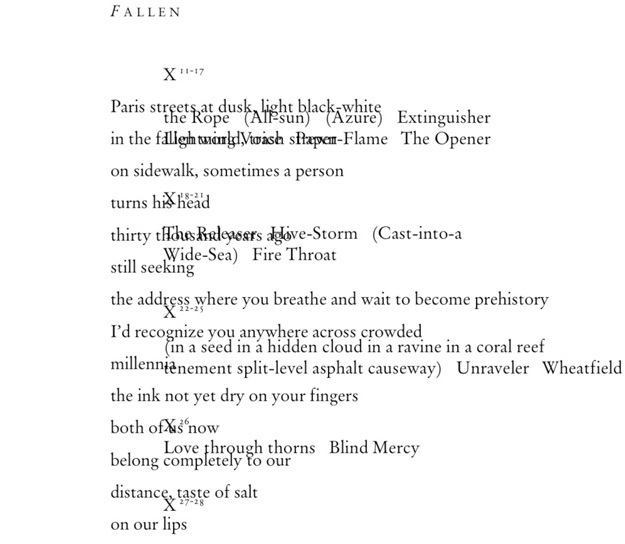 The last poem in the collection is “Fallen,” where title conjures spirit and body. The poem begins in the material, with algebraic exponent. But Stricker writes it incorrectly, I assume purposefully, as X11-17 rather than 1/X6. We are told by the speaker that we’d be “recognize[d] … anywhere across crowded … causeway.” The book is a dream; “the book is a Heisenberg.” That is to say, the book is related to uncertainty. Blanketed in uncertainty, the question of what mistake means lingers long after putting the book down. 1. Meredith Stricker, Mistake (Pittsburgh: Caketrain, 2012), 78. 2. Barbara Guest, “Poetic Statement: The Forces of Imagination,” in American Women Poets in the Twenty-First Century: Where Lyric Meets Language, ed. Claudia Rankine and Juliana Spahr (Middletown: Wesleyan University Press, 2002), 189–90. 3. Andrew Olendzki, “Burning Alive: Turn Down the Thermostat and Cool Down the Fire of Our Minds,” Tricycle Summer 2009. 4. Josh Clark, “How Quantum Suicide Works,” How Stuff Works April 2013. 5. Using numbers to reference repeating lines, or phrases, the form is as follows: 1, 2, 1, 3, 2, 4, 3, 5, 4, 6, 5, 7, 6, 8, 7, 9, 9, 10, 9, 11, 10, 12, 11, 13, 12, 14, 13, 15, 14, 16, 15, 16, 16, 17, 16, 18, 17, 18. 7. 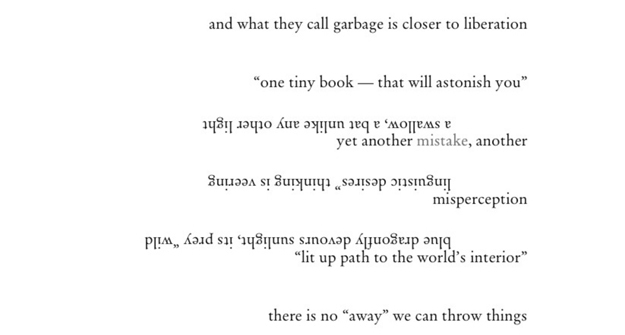 Leslie Scalapino, “Eco-logic in Writing,” in Eco Language Reader, ed. Brenda Iijima (Brooklyn and Callicoon, NY: Yo-Yo Labs and Nightboat Books, 2010), 60–78.